"Monsters vs. Aliens," which is slated for a domestic release date of March 27, 2009, reinvents the classic '50s monster movie into an irreverent modern day action comedy. 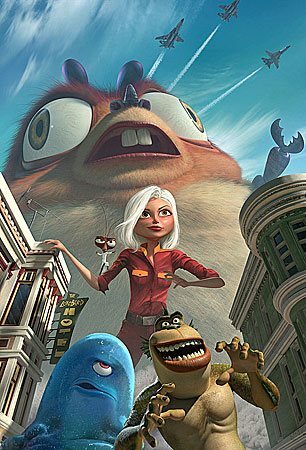 The cast of "Monsters vs. Aliens" includes: Oscar® winner Reese Witherspoon ("Walk the Line," "Rendition") as Susan Murphy, a.k.a. Ginormica; Golden Globe winner Hugh Laurie (TV's "House," "Stuart Little") as Dr. Cockroach, Ph.D.; Will Arnett (TV's "Arrested Development," "Blades of Glory") as The Missing Link; Seth Rogen ("Knocked Up," "Superbad") as B.O.B. ; Rainn Wilson ("Juno," TV's "The Office") as Gallaxhar; Emmy winner Stephen Colbert (TV's "The Colbert Report," "Bewitched") as The President of the United States; Golden Globe winner Kiefer Sutherland (TV's "24," "Phone Booth") as General W.R. Monger; and Paul Rudd ("Knocked Up," "Night at the Museum") as Susan's boyfriend, Derek. 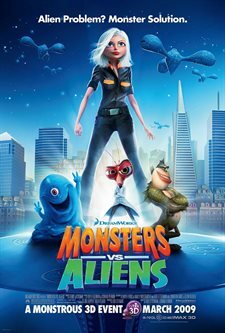 "Monsters vs. Aliens" is directed by Rob Letterman ("Shark Tale") and Conrad Vernon ("Shrek 2"), produced by Lisa Stewart ("I Think I Love My Wife") and co-produced by Jill Hopper and Latifa Ouaou. The film marks the theatrical debut of DreamWorks Animation's Ultimate 3-D, the studio's proprietary production process of authoring its animated films in 3-D from start to finish. When California girl Susan Murphy is unexpectedly clobbered by a meteor full of outer space gunk, she mysteriously grows to 49-feet-11-inches tall and is instantly labeled a "monster" named Ginormica. The military jumps into action, and she is captured and held in a secret government compound. The world learns that the military has been quietly rounding up other monsters over the years. This ragtag group consists of the brilliant but insect-headed Dr. Cockroach, Ph.D.; the macho half-ape, half-fish The Missing Link; the gelatinous and indestructible B.O.B. ; and the 350-foot grub called Insectosaurus. Their confinement time is cut short however, when a mysterious alien robot lands on Earth and begins storming the country. Download Monsters vs. Aliens in Digital HD from the iTunes store. Monsters vs. Aliens images are © Paramount Pictures. All Rights Reserved. Animated movies are assembled out of some basic component parts. There are the adult-demographic jokes -- designed to play to the parents; there are the sidekicks, colorful, usually without any arc, and designed for humor value; there is the "set back" in the 3rd act (as reliable as the boy-loses girl false-dawn element of romantic comedies); there's the moral (high-end animated movies are rarely just 'adventure stories'); there are the always-key celebrity voice actors. When you assemble these with re-heated unimaginative components, you can get a clunker like Valiant -- when you do at least a decent job, you get something like Bolt;--and when you do a cracking job putting them together, you get something like Monsters vs. Aliens. The basic premise is that there have been monsters amongst us, including some really big ones, but the government protects us from them by hiding them away in a secret facility. When Susan Murphy (voiced ably by Reese Witherspoon) is hit by a meteor on her wedding day and becomes a 50-foot woman, she is whisked away to Area 52 to be the latest inmate of monster prison. Soon after, when aliens attack, she and her fellow monsters are released to help fight them. The movie's message has to do with (amongst other things) not being a push-over and not settling for an unhappy life because you can do better than that. The sidekicks/celebrity voice-actors are The Missing Link (Will Arnett) a de-thawed fisherman who has a (mild) libido and fondness for spring-break hangouts; Dr. Cockroach, PhD (Hugh Laurie), a mad-scientist who mutated himself into a roach-form in a science accident, and B.O.B (Seth Rogen) who was a genetically altered tomato injected with ranch dressing (now an indestructible blob). The adult-demographic jokes come from call-backs to other science fiction movies and Stephen Colbert playing the president of the United States. The movie is in 3D and really by this point, I can only repeat what I've said before: it is not a gimmick - it is an experience enhancer. See it in 3D if you can. Is there anything surprising in Monsters vs. Aliens? No, not really. I can't think of anything that made me sit up out of my seat or go "I can't believe I'm seeing this." It is a kid's movie, and its formula, but it has reasonable heart and good production values and holds up with anything you would go to see on a Saturday afternoon with the whole family. I was able to tick-off plot-points as I watched them come from afar, but everyone, including the wonderful villain Gallaxhar (Rainn Wilson), seems to be having a good time; and the movie carries that vibe with it all the way through. Monsters vs. Aliens images © Paramount Pictures. All Rights Reserved. Watching with my Gabby. Neither of us have seen this.